Hey y’all! Were you expecting to see a menu plan today?! I decided that I would be discontinuing the Menu Plan Monday series indefinitely. I haven’t really decided “what”, if anything, I want to do on Monday’s now. So, at least for today, I decided to show you a picture of an awesome burger I made from my bloggy friend Sheena’s blog! I actually made this sometime before we moved to Arizona ….. I can’t remember exactly when though. The only thing I did different was I grilled the burgers, otherwise, I didn’t change anything about the recipe! 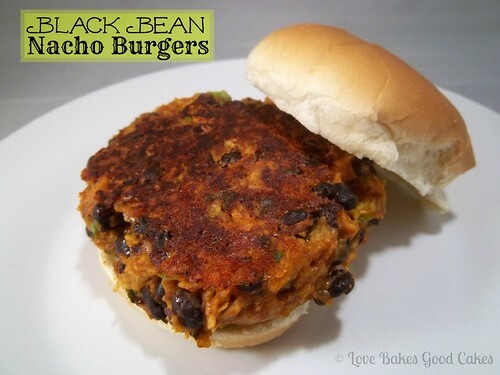 My family loved these Black Bean Nacho Burgers …. and I’m looking forward to having them again in the very near future! If you’re interested in trying them for yourself, be sure to check them out over at Hot Eats and Cool Reads! You can find the full recipe over there as well! Looks fantastic, great job as usual! Stopping by from the blog hop to thank you for hosting and let you know I started following on google friend connect. The burger looks amazing! oh wow…that looks mighty delicious, wonder if I could make it just as good. Yum! I would like mine with a big dollup of guac on top! Thanks for posting this recipe. Love black beans and these look great. Went over and got the recipe. I love burgers Jamie and would definitely like to try this one. Looks great! Oh, I love the idea of this! 🙂 So clever! Thank you so much for linking up with me this week at Tasty Tuesdays! I’ve pinned this & shared it with my followers!